Although York SC and vicinity had the "snowstorm of the century" this week--18" of white stuff fell on Hilton Pond Center on 26-27 February--we missed ALL of it and have no first-hand report of the weather's effects. Seems we were off on a five-day trip to "wintry" Iowa, where there was almost no snow cover and temperatures hovered in the lower 60s. We regret not being able to observe how wildlife reacted to the unusual storm at Hilton Pond, but we WERE on an important mission--visiting schools (below) and training teachers in protocols for Operation RubyThroat: The Hummingbird Project and The GLOBE Program. 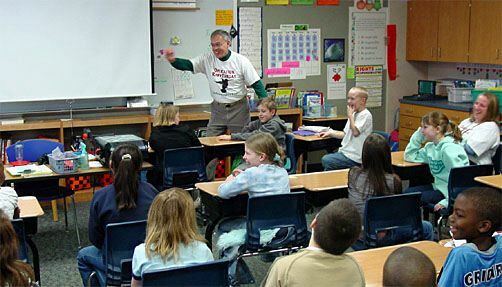 Operation RubyThroat--the Center's main education outreach activity--exists as an independent project and has its own Web site, but it also functions in collaboration with The GLOBE Program. 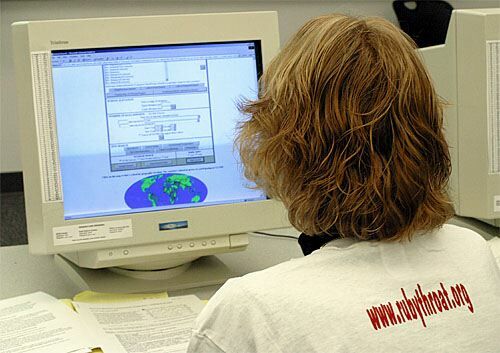 GLOBE, like Operation RubyThroat, is an international science learning initiative aimed primarily at K-12 students. Through GLOBE, students around the world have been making observations for nearly ten years and submitting on-line data about environmental factors such as atmosphere and climate (e.g., clouds, min/max temperature, relative humidity, etc. ), soils (including soil type and temperature), hydrology (i.e., the study of water, including salinity, pH, temperature, etc. ), and land cover. 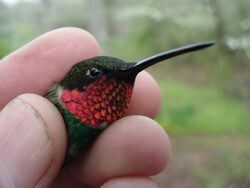 When Operation RubyThroat was added to GLOBE in early 2002, it was the first protocol to involve observations of animal behavior, specifically that of Ruby-throated Hummingbirds, Archilochus colubris. It also allowed students to correlate hummingbird observations against other GLOBE data to see what effects non-living aspects of the environment might have on hummingbirds. Recently, GLOBE has expanded to include observers other than just K-12 students; these days, anyone who gets trained in the GLOBE protocols can submit data. 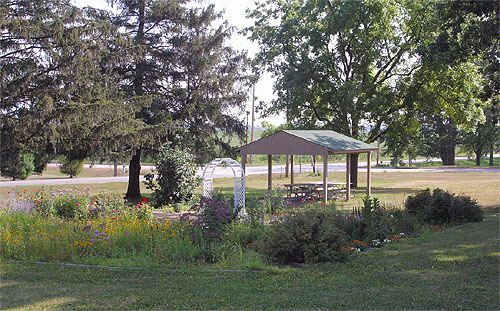 Thus, GLOBE has shifted toward "citizen science," with folks from retirement home residents to scout troops and Sierra Club members to master gardeners adding their observations to those made by schoolkids and teachers (below). A year ago, GLOBE's principal investigators (PIs)--the scientists and educators from around the country who create GLOBE protocols and analyze results--gathered in Washington DC and came up with another new concept: Working collaboratively on a scientific problem in a specific community and involving teachers, students, local experts, businesses, and laypeople in the process. Because GLOBE has a productive statewide program in Iowa, we decided to concentrate on that state's Black Hawk County--including the twin cities of Cedar Falls and Waterloo--and to look at how dissimilar agricultural practices might affect (or be affected by) various environmental factors. To be concise, this investigative field campaign--which we now call GLOBE ONE--will examine how different crop rotations, soil tillage techniques, and crop residue retention affect local soil, microclimate, water, and plant growth and development. In Iowa, this basically means that we'll be looking at soybeans vs. corn, till vs. no-till, and removal vs. non-removal of stubble and other harvest remnants. 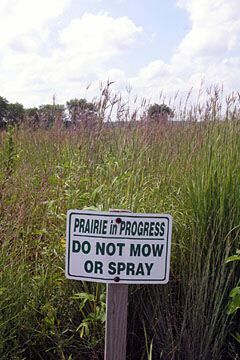 We'll also study native and restored prairies (right), using them as a sort of "control group." We settled on this comprehensive project after several GLOBE PIs visited Iowa in the summer of 2003 and came away with the idea that a agriculture-related project would provide greatest benefits for ALL participants. As part of their standards-based curriculum, students involved in GLOBE ONE will make the majority of the observations and--in conjunction with the PIs--will analyze the data for trends. Along the way, students and adult participants will learn lots about the scientific method, mathematics and graphing, seasonal changes, agricultural techniques, and how to communicate and write up their work. It's not unlikely that some students or student teams will eventually coauthor with the PIs and publish in technical journals some new discovery about the relationships among various factors they observe. Ruby-throated Hummingbirds (RTHUs) are birds of the edge; i.e., they tend to occur not in deep woods or in completely open areas, but around the margins of those habitats where there is greater plant diversity with regard to species and structure. Even though row-crop areas (corn or soybeans) of discrete size have edges, we hypothesize that the greater diversity of plants in and around native prairies will host more RTHUs. Although RTHUs survived perfectly well prior to the invention of artificial hummingbird feeders and the intentional planting of hummingbird nectar flowers, we hypothesize that RTHUs will be more plentiful around these enhancements than in either agricultural fields or prairie habitats. Row-crop areas in the GLOBE ONE study sites are monocultures of either corn or soybeans. Within either of these crops, green-up in spring will be uniform--as will green-down in autumn--with the latter being affected either by natural processes or harvesting. In either case, we hypothesize that in autumn RTHUs will tend to utilize areas in and around soybean fields rather than in and around corn fields. GLOBE ONE begins in earnest in Spring 2004 when buds begin to burst on trees and shrubs in Black Hawk County, and when the first hummingbirds return to central Iowa. The initiative will continue throughout 2004 and end with the fall corn/soybean harvests in 2005. Over the 18-month duration of GLOBE ONE--which is funded by the National Science Foundation--PIs will train and work closely with teachers, students, and the general public on observational techniques and data analysis. In the end, participants will be able to say they learned a great deal about their local community by employing measuring instruments, standard observational techniques, and valid scientific processes to draw meaningful conclusions about the world of Iowa agriculture. No one really knows how GLOBE ONE is going to turn out, but it will be a community-wide science learning initiative that will be fun to watch and participate in. Although this grand experiment will occur far from Hilton Pond Center, it's definitely a project worth implementing. --Due to the Iowa trip, this week we were only at Hilton Pond Center on 24 Feb and part of the day on the 25th. Nonetheless, we managed to capture and band a surprising number of winter finches (see totals at left). Our only regret is that we weren't at the Center during the two-day 18" snowstorm that undoubtedly would have brought in large flocks of birds.